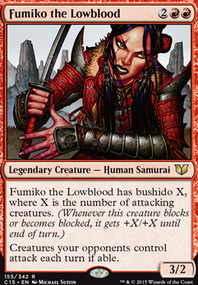 The point of having Fumiko the Lowblood as a commander, first and foremost, is to mess with people. Supported by other cards, she forces other players to interact and send their creatures around to throw elbows, especially when they don’t want to. While those creatures are busy with all that, I have plenty of big scary guys for them to run into, and then the way is clear for said scary guys to attack. 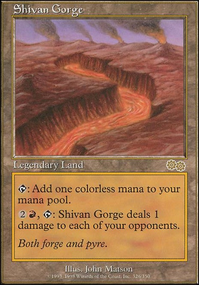 To keep me in the game and to let me be able to actually play the big stuff, I pack a fair amount of removal and artifact mana, as well as a higher than average land count for a Commander deck. Dude! My deck, by way of the CMDR Decks video, got featured in Gavin Verhey's Daily Deck List! The video was recorded a while ago, so some things have changed since then, but still. Wooo!